An homage to the legendary Single Action Army. Born from Old West tradition, the Rough Rider maintains much of the look and feel of the legendary Colt Single Action Army Revolver - but in a scaled-down version. Chambered for the .22LR, the Rough Rider is manufactured using state-of-the-art-precision machinery that assures its accuracy and reliability. The cylinder lock-up is tight and the perfect timing of the action makes for a handgun that will put its shots where you want 'em. For hunting, plinking or cowboy action shooting, let the Rough Rider be your choice in a new Rimfire Revolver. 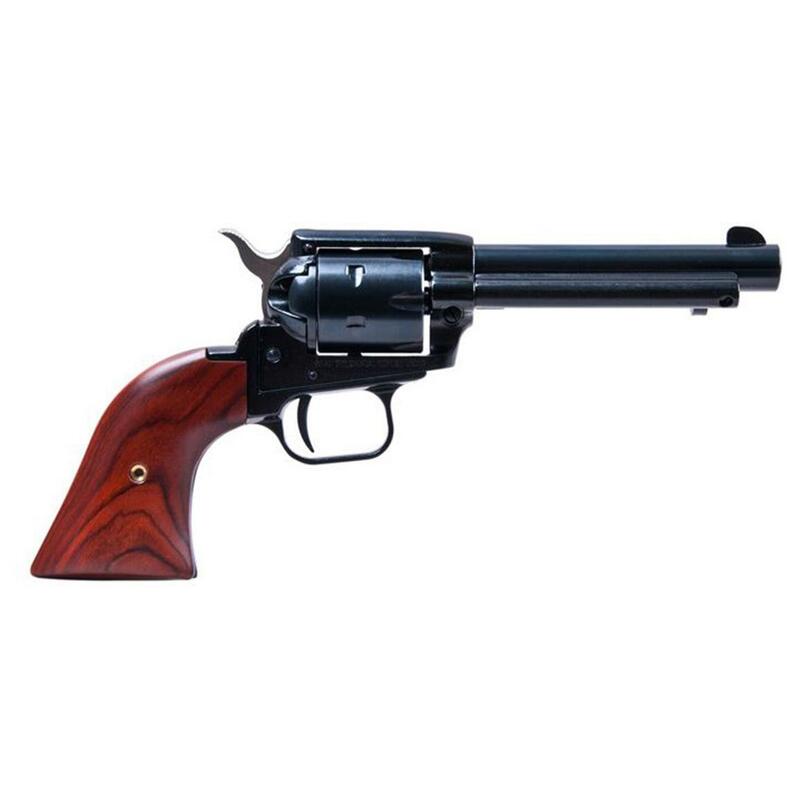 Heritage Rough Rider, Revolver, .22LR, Rimfire, 4.75 Barrel, 6 Rounds is rated 4.5 out of 5 by 30. Rated 5 out of 5 by Robert from Great .22 This is a great little revolver. Way better than I expected. I'll be carrying it around the property a lot for fun and varmint control. I don't think you could ask for more, especially at that price. Fairly accurate right out of the box. Rated 5 out of 5 by Dave from Excellent and easy to read title I love this 22 revolver. It is fun to shoot. The price was great. And now that ammo is plentiful I will be shooting it often. It is accurate with the sights. this is a quality gun. American made. I was shipped extremely quickly. Rated 5 out of 5 by Dal50 from very good price! received weapon with in a week. Weapon was in great shape. I have not fired it yet. Rated 3 out of 5 by ANGEL13JASON from GOOD PRICE GOOD PRICE, FRO $120.00 COULDN'T ASK FOR GREAT QUALITY. DOES WHAT IS SUPPOSE TO DO. Rated 5 out of 5 by Coach 23 from Value Plus Better than I co9uld have imagined! Rated 5 out of 5 by Jkerr from I love these pistols. This is the second one of these that I have purchased. They are accurate and fun. Many Jack Rabbits are sleeping uneasy in the desert tonight. I love the single action revolver. There is just something about it that seems satisfying.